I stumbled upon this great gadget called Privacy Enhanced Computer Display developed by the Mitsubishi Electric Research Laboratories. This article isn’t new (the date of modification is six years ago) but I find this gadget to be very interesting and is something that I would wish to have. The privacy enhanced computer display isn’t your ordinary desktop monitor. When you look at it with your bare eyes, all you can see is flickering grey images. You will need to wear a special pair of glasses to view the actual images displayed on the monitor. Below is a quote from the website on how this device works. The display alternately displays the desired information in one field, then the inverse image of the desired information in the next field, at up to 120 Hz refresh. The ferroelectric shutter glasses allow only the desired information to be viewed, while the inverse image causes unauthorized viewers to perceive only a flickering gray image, caused by the persistence of vision in the human visual system. This device was initially designed for use in public place such as hospitals, banks, pharmacies and government departments. In those places, confidential information displayed on a monitor is at risk of being exposed to onlookers. Therefore, the implementation of this device protects data security and ensures only staff members are able to view the data. So, why would I want a device like this? Thumb drives should be one of the most popular storage medium used nowadays. Its advantages over other storage medium such as CD are convenient, faster read/write speed and large capacity. Unlike when thumb drives were first introduced, they are now capable of storing up to a few gigabytes of data. Due to portability and the large capacity, computer users are keeping more data into their thumb drives — songs, movies, files, programs and photos. Some users may even store confidential files in their thumb drives. The problem that needed to be addressed was how to properly safeguard the data contained in the thumb drives. A few years back, some thumb drives are bundled with encryption features. However, encrypted passwords can still be hacked if the password isn’t strong enough. 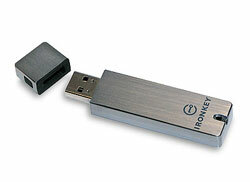 Introducing IronKey, the grade thumb drive. IronKey was first developed for military use. Data on the thumb drive are scrambled and encrypted using a hardware encryption chip. The inside of the thumb drive is filled with a solution called epoxy. Therefore, any attempt to open the thumb drive physically may cause damage to the chips inside. To make matters a little tougher for any potential hacker, the encryption chip will self-destruct when 10 incorrect password attempts were recorded. This is one heavy duty thumb drive, eh? It is available to the public now at a price range of $78.99 to $148.99. The only available model now is the 2GB version at a price of $109.00. The 1GB and 4GB thumb drives will be out soon. Hop over to ThinkGeek for more information. Do you keep any “sensitive” data in your thumb drive? Have you ever lost a thumb drive that contained data or files that no one else should see? If yes, what was it? If you are looking for gifts for a special occasion, you may want to check out Angel Kitty’s USB Keyboard Bra. According to Steve Levenstein, each Angel Kitty USB Keyboard Bra costs ¥15,750 (about $130) plus shipping. You can get a standard keyboard at a much cheaper price but it sure doesn’t give you as much fun! Do you know what is your typing speed? Have you ever compared your typing speed with your friends or colleagues? Do you boast and feel proud knowing you can touch type? Well, I have (but that happened many many years ago). Touch typing is one of the ways to improve your typing speed. However, it may be tough to teach an old dog new tricks. 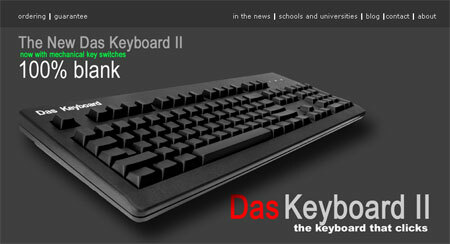 Don’t worry, with the new Das Keyboard II, I guess you have no choice but to learn how to touch type! Imagine a blank keyboard with no indicators of the keys. The keyboard costs a whooping $89.95USD. That’s a little over RM300 for a “basic” keyboard without additional multimedia keys. It’s so damn expensive you must be expecting gold in them. Guess what? There is gold in the keyboard! The Das Keyboard II is equipped with gold-plated key switches. That enables the Das Keyboard to be “rated up to 50 Million key strokes where as regular keyboards barely reach 10 to 15 Million strokes”. You see the two marker on the “F” and “J” keys? Put your left index finger on the “F” and your right index finger on the “J”. Put the rest of your fingers on the other keys and memorize the rest of the keys that are around it. That was all I needed. Of course, you’ll need a lot of practice as well. Thank goodness for IRC back then. I can say that I practised at least a few hours daily!